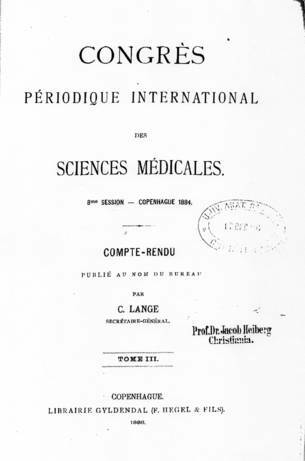 Malling-Hansen’s Presentation at the International Medical Congress in Copenhagen 1884. Transcription, comments and footnotes by Jørgen Malling Christensen and Sverre Avnskog. 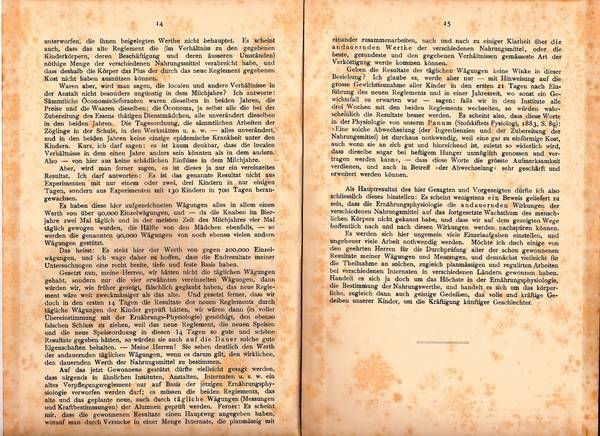 Jørgen Malling Christensen: The following text – known as “Fragment II” - is essential for our understanding of Malling-Hansen’s scientific research and his contribution to the discussion among experts in the fields of medicine, physiology and hygiene about the proper conditions for children’s growth. Malling-Hansen’s primary concern was not to foment his name as a great scientific researcher (even if that was actually what he was! )- rather, his focus was, at all times, to find out what kind of food and other conditions - fresh air, exercise etc – would be most beneficial for the children under his care at the institute for the deaf-mute. His forte and extreme advantage was that as principal and leader of the institute he had access to 130 children and the opportunity of weighing and measuring them on a daily basis over a period of several years. He made full use of that opportunity and applied strict scientific methods in his experiments and research. Thanks to the meticulous, thorough and long-lasting registrations of weights and heights of the pupils, Malling-Hansen probably felt a strong self-confidence when presenting his findings and preliminary conclusions at the International Medical Congress in Copenhagen in 1884. He had no formal academic training or education in medicine, physiology, hygiene, nutrition or in science in general; and he was about to face the international elite of scientists in these and other fields of medicine. Yet, his presentation exudes a strong sense of self-confidence. 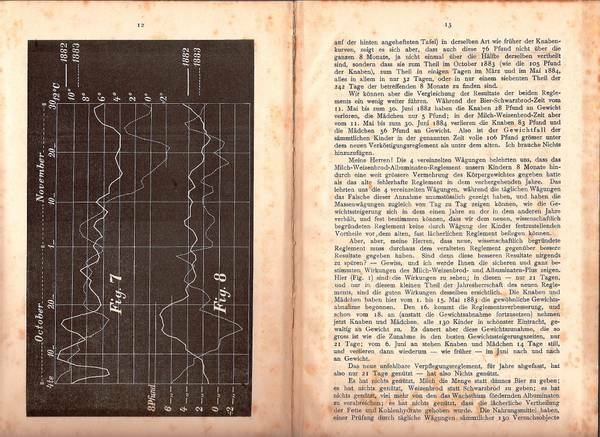 He was well aware that nobody else had ever done what he had done – no one had carried out this kind of physiological measurements on such a large scale, over such a long period and with the application of such rigorous scientific methods. The lecture which follows was probably a crowning point in his career and personal life. It was a moment of triumph and victory. 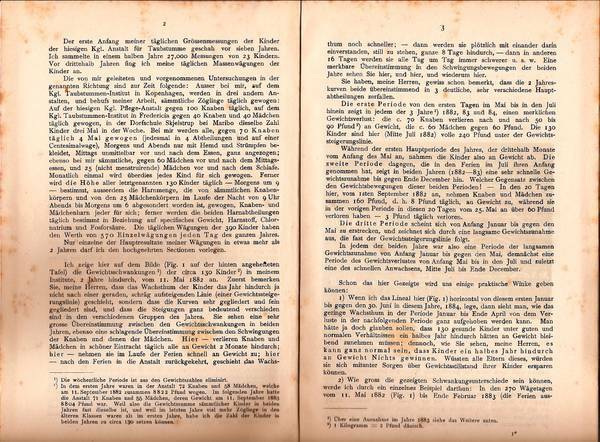 He gave the presentation in German and had previously prepared a German printed version of his findings – “Fragment II”. And he was not disappointed: According to all available records, his presentation was received with keen interest and great respect. It was also quoted and commented upon at the time and in the years to come in numerous journals and newspapers in many different countries. 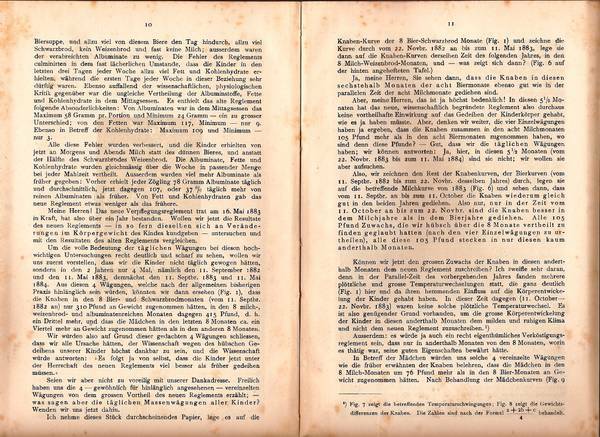 His command of the German language was adequate for the task of making the presentation in that language – probably, his period in Schleswig (1862-64), when he was a teacher and later principal at the Institute for the Deaf-Mute, was a great boost for his level of German – something that was undoubtedly very useful for him in terms of his contacts with colleagues and researchers in other European countries. The transcription renders the text exactly as it is printed in the booklet, in other words the sometimes antiquated spelling mode and the odd spelling mistake have been retained. Nothing has been excluded and nothing has been added, apart from my footnotes. 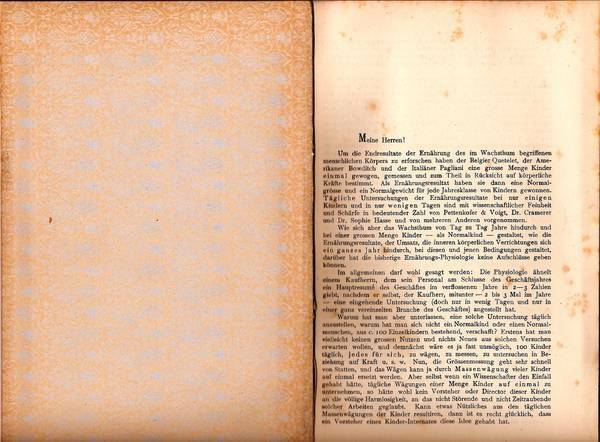 The front page of the booklet from 1884. Sverre Avnskog: We have this text from the archive of Malling-Hansen's great-great-grandson, Lars Mathiesen' who has kindly scanned it to us. Lars Mathiesen has collected a large number of very valuable documents and pictures from his line of descendants after Malling-Hansen, among them several original letters. 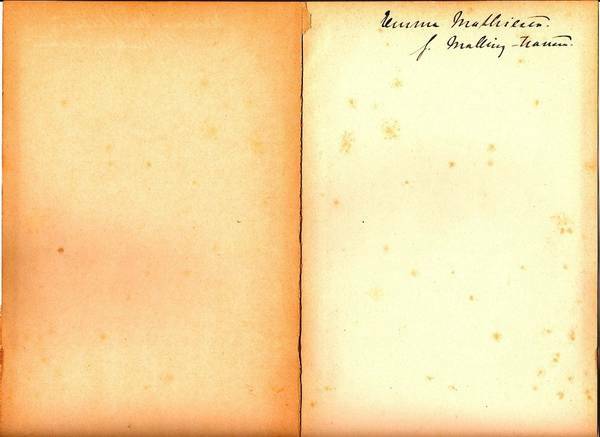 Mathiesen owns several copies of the little booklet from 1884; evidently Malling-Hansen had some left over from the 200 copies he had made previously to the meeting. They were made in hard cover in blue with the letters printed in gold, and I personally suspect that the text in the booklet is more comprehensive that the lecture itself, because we know from a review in "Nationaltidende" that Malling-Hansen only had an hour at his disposal, and he used some of that time to show and explain some large planches showing statistic material from his research. The only review in Danish about Malling-Hansen's lecture, was actually written by Malling-Hansen himself, and printed in the Danish newspaper "Nationaltidende" on the 18.th of August 1884, presented as editorial news. We know that from Malling-Hansen's correspondence with journalist Edg. Collins. Malling-Hansen was a master of Public Relations and when the Danish media didn't mention his work, he made sure it was given attention by using his contacts within the different newspapers. Malling-Hansen also used all of his skills in persuasion when he was allowed to speak to a somewhat larger assembly, as the pedriatic and the hygiene sections were merged. In their report about the congress in the Swedish periodical, Eira, one can read this about RMH's lecture: “In the combined sections for paediatrics and hygiene the principal of the Danish institute for the Deaf-Mute, pastor MALLING-HANSEN, gave a lecture about weighing and measurements of children, informing that the children of the institute are being weighed daily and stated that this type of group weighings constituted the best possible way – by establishing a multitude of similar investigations in other similar institutions, preferably in all countries and under close cooperation – to arrive at a clear knowledge concerning the nutritional value of different food stuffs. “ (Translated from Swedish by JMC). Later on the same day as Malling-Hansen spoke to the congress, the president of the congress, Professor Peter Ludwig Panum, held his lecture. What is of great interest is that he told that it was him who originally had turned to Malling-Hansen with a request to do some research about the children and the nutrition of their food, and he had suggested some changes in their diet. 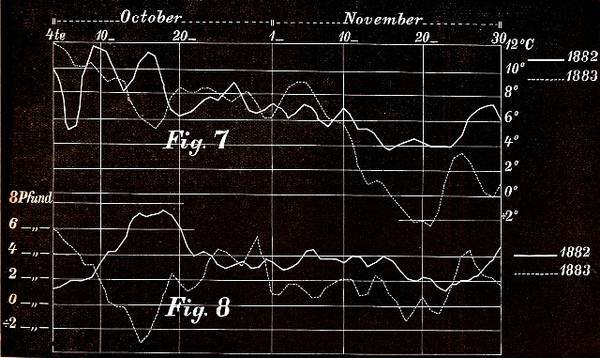 It was in connection with these changes, which were carried out by Malling-Hansen, that Malling-Hansen himself decided to investigate what impact the improved nutrition would have on the physical development of the children. I think one is not incorrect to assume that it was actually Prof. Panum who initiated the research that occupied Malling-Hansen's mind for several years. It was originally another authority in childcare in Denmark who urged Malling-Hansen to address the Congress and tell about his very detailed investigations; the leader of the pediatric section, Prof. Harald Hirschsprung. Malling-Hansen agreed, but he was not satisfied to only speak to the pediatric section, and he urged them to let him speak to the large audience, and finally his wish was partially granted as two of the sections were merged. 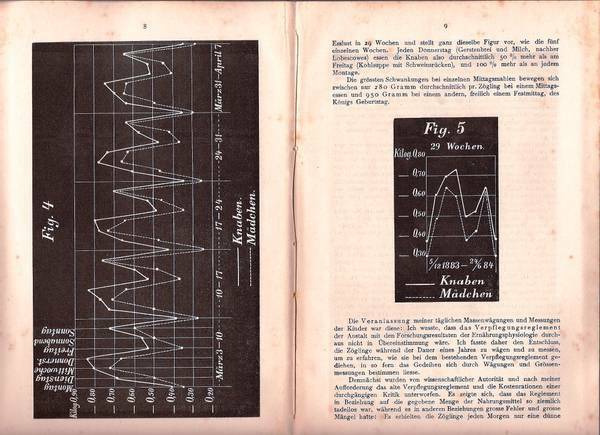 It is quite right what Jørgen Malling writes that Malling-Hansen was given a lot of attention from international scientists, newspapers and journals in the years after 1884 and especially in connection to his third book, Fragment III from 1886. 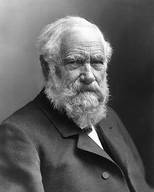 When he died in 1890 he was a famous Dane in many countries, such as Germany, Great Britain and France, and also had prepared an additional work about his research. This unfinished manuscript was later destroyed by his daughters, with the motivation that Malling-Hansen's spirit didn’t want anybody to use this unfinished material. The daughters claimed to have contact with their late father's spirit. Malling-Hansen's daughters were very disappointed that Malling-Hansen never received the acknowledgement they thought he deserved from the Danish scientist environment. Malling-Hansen himself also pointed several times to the fact that he received several letters from scientists abroad thanking for receiving copies of his works, whereas Danish scientists hardly bothered to answer him at all. And considering all the publicity in Danish newspapapers in connection with the medical congress which was considered a great honor to arrange, surprisingly little can be found about Malling-Hansen's lecture. It is as they weren't able to recognize that one of their own fellow countrymen actually was one of the great names at the congress. Was it a result of the fact that Malling-Hansen was not a skilled scientist but an outsider? Or was it plain jalousie? May be was it both these factors that lead to the sad fact that Malling-Hansen's great scientific work never reached the same recognition in Denmark as in several other countries. Fragment II was never published in Danish, but hitherto exists only in the German version that we hereby present. Many more details about Malling-Hansen's lecture in 1884 can be read in this section: Lectures by Malling-Hansen. 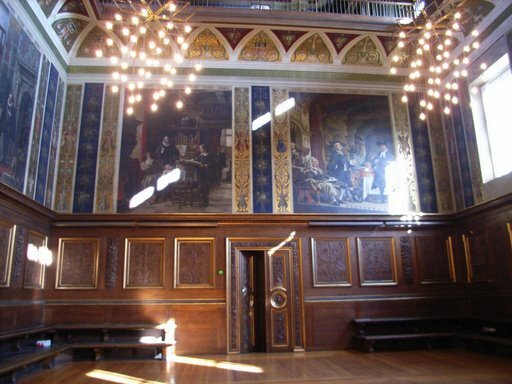 It was here in the "Ceremonial Hall" at The University of Copenhagen that Rasmus Malling-Hansen spoke on the very last day of the large International Medical Congress in Copenhagen in 1884 to the main assembly. Some of the listeners were among the world's most famous scientists at that time. President of the congress, Prof. Peter Ludwig Panum, 1820-1885. Leader of the pediatric section, Prof. Harald Hirschsprung, 1830-1916. Photo: The Royal Library. 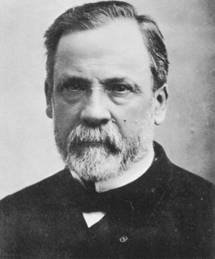 Probably the most prominent lecturer at the congress, Louis Pasteur, 1822-1895. A drawing of Malling-Hansen, based on a picture taken in 1885. 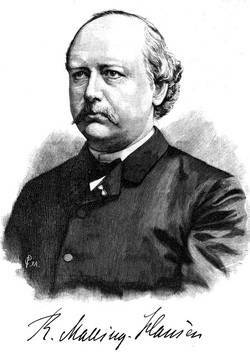 This portrait was used in a large presentation of Malling-Hansen in the Danish newspaper "Nutiden" in 1886. T ä g l i c h e W ä g u n g e n der 130 Zöglingedes Königlichen Taubstummen-Instituts in Kopenhagen. Um die Endresultate der Ernährung des im Wachsthum begriffenen menschlichen Körpers zu erforschen haben der Belgier Quetelet, der Amerikaner Bowditch und der Italiäner Pagliani eine grosse Menge Kinder e i n m a l gewogen, gemessen und zum Theil in Rücksicht auf körperliche Kräfte bestimmt. Als Ernährungsresultat haben sie dann eine Normalgrösse und ein Normalgewicht für jede Jahresklasse von Kindern gewonnen. T ä g l i c h e Untersuchungen der Ernährungsresultate bei nur e i n i g e n Kindern und in nur w e n i g e n Tagen sind mit wissenschaftlicher Feinheit und Schärfe in bedeutender Zahl von Pettenkofer & Voigt, Dr. Cramerer und Dr. Sophie Hasse und von mehreren Anderen vorgenommen. Wie sich aber das Wachsthum von Tag zu Tag Jahre hindurch und bei einer grossen Menge Kinder – als Normalkind – gestaltet, wie die Ernährungsresultate, der Umsatz, die inneren körperlichen Verrichtungen sich e i n g a n z e s J a h r hindurch, bei diesen und jenen Bedingungen gestaltet, darüber hat die bisherige Ernährungs-Physiologie keine Aufschlüsse geben können. Im allgemeinen darf wohl gesagt werden: Die Physiologie ähnelt einem Kaufherrn, dem sein Personal am Schlusse des Geschäftsjahres ein Hauptresumé des Geschäftes im verflossenen Jahre in 2-3 Zahlen giebt, nachdem er selbst, der Kaufherr, mitunter – 2 bis 3 Mal im Jahre – eine eingehende Untersuchung (doch nur in wenig Tagen und nur in einer ganz vereinzelten Branche des Geschäftes) angestellt hat. Warum hat man aber unterlassen, eine solche Untersuchung täglich anzustellen, warum hat man sich nicht ein Normalkind oder einen Normalmenschen, aus c. 100 Einzelkindern bestehend, verschafft? Erstens hat man vielleicht keinen grossen Nutzen und nichts Neues aus solchen Versuchen erwarten wollen, und demnächst wäre es ja fast unmöglich, 100 Kinder täglich, j e d e s f ü r s i c h, zu wägen, zu messen, zu untersuchen in Beziehung auf Kraft u.s.w. Nun, die Grössenmessung geht sehr schnell von Statten, und das Wägen kann ja durch M a s s e n w ä g u n g vieler Kinder auf einmal ersetzt werden. Aber selbst wenn ein Wissenschaftler den Einfall gehabt hätte, tägliche Wägungen einer Menge Kinder a u f e i n m a l zu unternehmen, so hätte wohl kein Vorsteher oder Director dieser Kinder an die völlige Harmlosigkeit, an das nicht Störende und nicht Zeitraubende solcher Arbeiten geglaubt. Kann etwas Nützliches aus den täglichen Massenwägungen der Kinder resultieren, dann ist es recht glücklich, dass ein Vorsteher eines Kinder-Internates diese Idee gehabt hat. Der erste Anfang meiner täglichen Grössenmessungen der Kinder der hiesigen Kgl. Anstalt für Taubstumme geschah vor sieben Jahren. Ich sammelte in einem halben Jahre 27,000 Messungen von 23 Kindern. Vor drittehalb Jahren fing ich meinen täglichen Massenwägungen der Kinder an. Die von mir geleiteten und vorgenommenen Untersuchungen in der genannten Richtung sind zur Zeit folgende: Ausser bei mir, auf dem Kgl. Taubstummen-Institut in Kopenhagen, werden in drei andern Anstalten, und behufs meiner Arbeit, sämtliche Zöglinge täglich gewogen: Auf der hiesigen Kgl. Pflege-Anstalt gegen 100 Knaben täglich, auf dem Kgl. Taubstummen-Institut in Fredericia gegen 40 Knaben und 40 Mädchen täglich gewogen, in der Dorfschule Skjelstrup bei Maribo dieselbe Zahl Kinder drei Mal in der Woche. Bei mir werden alle, gegen 70 K n a b e n t ä g l i c h 4 M a l g e w o g e n (jedesmal in vier Abtheilungen und auf einer Centesimalwage), Morgens und Abends nur mit Hemd und Strümpfen bekleidet, Mittags unmittelbar vor und nach dem Essen, ganz angezogen; ebenso bei mir sämmtliche, gegen 60 Mädchen vor und nach dem Mittagsessen, und 25 (nicht menstruierende) Mädchen vor und nach dem Schlafe. Monatlich einmal wird überdies jedes Kind für sich gewogen. Ferner wird die H ö h e aller letzgenannten 130 Kinder täglich - Morgens um 9 - bestimmt, ausserdem die Harnmenge, die von sämmtlichen Knabenkörpern und von den 25 Mädchenkörpern im Laufe der Nacht von 9 Uhr Abends bis Morgens um 6 abgesondert werden ist, gewogen, Knaben- und Mädchenharn jeder für sich; ferner werden die beiden Harnabtheilungen täglich bestimmt in Beziehung auf spezifisches Gewicht, Harnstoff, Chlornatrium und Phosphorsäure. Die täglichen Wägungen der 390 Kinder haben den Werth von 570 E i n z e l w ä g u n g e n j e d e n T a g des ganzen Jahres. Nur einzelne der Hauptresultate meiner Wägungen in etwas mehr als 2 Jahren darf ich den hochgeehrten Sektionen vorlegen. JMC: Lambert Adolphe Jacques Quetelet, 1796-1874, Belgian astronomer, mathematician, statistican and sociologist. 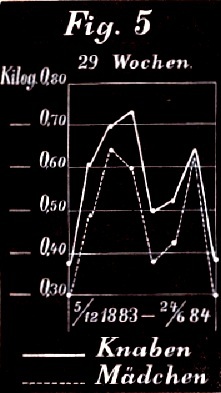 Quetelet established a simple measure for classifying people’s weight relative to an ideal weight for their height: The body mass index, still widely in use. JMC: Henry Pickering Bowditch, 1840 – 1911, American soldier, physician, physiologist, Harvard professor and dean. He did several years of medical studies in Europe: In Paris from 1868 with Claude Bernard; later on in Bonn, Germany, with Wilhelm Kuhne and Max Schultze; further in Leipzig with Carl Ludwig. 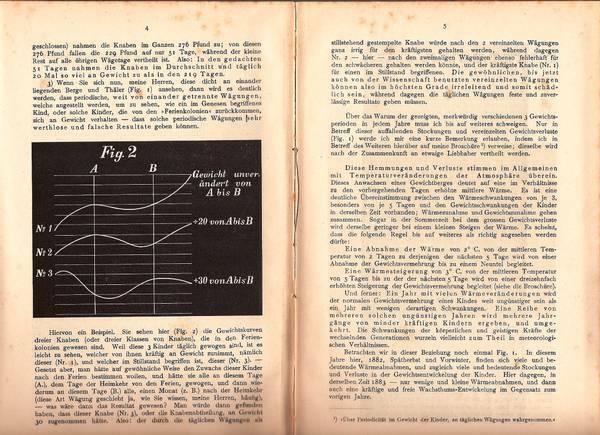 Among many other areas of research, Bowditch was keenly interested in anthropometry and showed how nutrition and environmental factors contribute to physiological development of the human body. JMC: Luigi Pagliani, 1847 – 1931, Italian physician of major importance for public sanitation and hygiene in Italy. In 1878 he founded the Italian “Society of Hygiene”. He was appointed as the key expert for the development of hygienic standards in Italy. 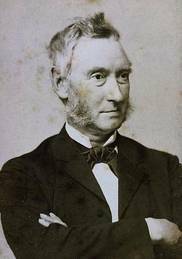 JMC: Max von Pettenkofer, 1818 – 1901, German physician, professor and university dean. He was the first German professor of Hygiene and the founder of the Institute for hygiene (1876). From 1890 -1899 president of the Bavarian Scientific Academy. JMC: The village of Skelstrup was – and is still – situated between Hunseby, where Rasmus Malling-Hansen and his two brothers were born and raised, and the town of Maribo. His two younger brothers both graduated from the teacher training college of Jonstrup, following in the footsteps of Rasmus. It is very likely that one of the two brothers was head teacher at Skelstrup school at the time and agreed with Rasmus to involve the pupils of the school in the routines of frequent weighings in order to help the elder brother with his investigations. SA: Actually both of Malling-Hansen's brothers, Thomas Jørgen and Johan Frederik worked as teachers at Skelstrup for some years, but only Johan Frederik stayed there until he retired. They both married late, and lived together with their mother until the youngest brother married in 1878. 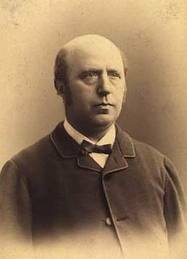 Jørgen moved to Ringsted with his mother in 1877 but didn't marry until after her death in 1885. He became headmaster and inspector at the school in Ringsted. Thus when Malling-Hansen started his weighings in a large scale only the youngest brother worked at Skelstrup. We have no other information than that his position was teacher and organ player at the school. Lambert Adolphe Jacques Quetelet, 1796-1874, Belgian astronomer, mathematician, statistican and sociologist. Henry Pickering Bowditch, 1840 – 1911, American soldier, physician, physiologist, Harvard professor and dean. Luigi Pagliani, 1847 – 1931, Italian physician of major importance for public sanitation and hygiene in Italy. Max von Pettenkofer, 1818 – 1901, German physician, professor and university dean. This is Fig 1, 6 and 9 from Malling-Hansen's lecture. Ich zeige hier auf dem Bilde (Fig. 1 auf der hinten angehefteten Tafel) die Gewichtsschwankungen der circa 130 Kinder in meinem Institute, 2 Jahre hindurch, vom 11. Mai an. Zuerst bemerken sie, meine Herren, dass das Wachsthum der Kinder das Jahr hindurch ja nicht nach einer geraden, schräg aufsteigenden Linie (einer Gewichtssteigerungslinie) geschieht, sondern dass die Kurven sehr gegliedert und fein gegliedert sind, und dass die Steigungen ganz bedeutend verschieden sind in den verschiedenen Gruppen des Jahres. Sie sehen eine sehr grosse Übereinstimmung zwischen den Gewichtsschwankungen in beiden Jahren, ebenso eine schlagende Übereinstimmung zwischen den Schwingungen der Knaben unde denen der Mädchen. H i e r - verlieren Knaben und Mädchen in schöner Eintracht täglich alle an Gewicht 2 Monate hindurch; h i e r - nehmen sie im Laufe der Ferien schnell an Gewicht zu; h i e r - nach den Ferien in die Anstalt zurückgekehrt, geschieht das Wachsthum noch schneller; - dann werden sie plötzlich mit einander darin einverstanden, still zu stehen, ganze 8 Tage hindurch, - dann in anderen 16 Tagen werden sie alle Tag um Tag immer schwerer u.s.w. Eine merkbare Übereinstimmung in der Schwingungsbewegunden der beiden Jahre sehen Sie hier, und hier , und wiederum hier. Sie haben, meine Herren, gewiss schon bemerkt, dass die 2 jahreskurven beide übereinstimmend in 3 deutliche , sehr verschiedene Hauptabtheilungen zerfallen. D i e e r s t e P e r i o d e von den ersten Tagen im Mai bis in den Juli hinein zeigt in jedem der 3 Jahre 1882, 83 und 84, einen merklichen Gewichtsverlust: die c. 70 Knaben verlieren nach und nach 50 bis 90 Pfund an Gewicht, die c. 60 Mädchen gegen 60 Pfund. Die 130 Kinder sind hier (Mitte Juli 1882) volle 240 Pfund unter der Gewichtssteigerungslinie. Während der ersten Hauptperiode des Jahres, der drittehalb Monate vom Anfang des Mai an, nahmen die Kinder also an Gewicht ab. Die Z w e i t e P e r i o d e dagegen, die in den Ferien im Juli ihren Anfang genommen hat, zeigt in beiden Jahren (1882-83) eine sehr schnelle Gewichtszunahme bis gegen Ende Dezember hin. Welcher Gegensatz zwischen den Gewichtsbewegungen dieser beiden Perioden ! - In den 20 Tagen hier, vom 1sten September 1882 an, nehmen Knaben und Mädchen zusammen 160 Pfund, d.h. 8 Pfund täglich, an Gewicht zu, während sie in der vorigen Periode in diesen 20 Tagen vom 25. Mai an über 60 Pfund verloren haben - 3 Pfund täglich verloren. D i e d r i t t e P e r i o d e scheint sich von Anfang Januar bis gegen den Mai zu erstrecken, und zeichnet sich durch eine langsame Gewichtszunahme aus, die fast der Gewichtssteigerungslinie folgt. In jedem der beiden Jahre war also eine Periode der langsamen Gewichtszunahme von Anfang Januar bis gegen den Mai, demnächst eine Periode des Gewichtsverlustes von Anfang Mai bis in den Juli und zuletzt eine des schnellen Anwachsens, Mitte Juli bis Ende December. 1) Wenn ich das Lineal hier (Fig. I) horizontal von diesem ersten Januar bis gegen den 30. Juni in diesem Jahre, 1884, lege, dann sieht mann, wie das geringe Wachsthum in der Periode Januar bis Ende April von dem Verluste in der nachfolgenden Periode ganz aufgehoben werden kann. Man hätte ja doch glauben sollen, dass 130 gesunde Kinder unter guten und normalen Verhältnissen ein halbes Jahr hindurch hätten an Gewicht bleibend zunehmen müssen; dennoch, wie Sie sehen, meine Herren, e s k a n n g a n z n o r m a l s e i n, d a s s K i n d e r e i n h a l b e s J a h r h i n d u r c h a n G e w i c h t N i c h t s g e w i n n e n. Wüssten alle Eltern dieses, würden sie sich mitunter Sorgen über Gewichststillstand ihrer Kinder ersparen können. D u r c h s c h n i t t u n d t ä g l i c h 2 0 M a l s o v i e l a n G e w i c h t z u a l s i n d e n 2 1 9 T a g e n.
3) Wenn sie sich nun, meine Herren, diese nicht an einander liegenden Berge und Thäler (Fig. I) ansehen, dann wird es deutlich werden, dass periodische, w e i t v o n e i n a n d e r g e t r e n n t e W ä g u n g e n, welche angestellt werden, um zu sehen, wie ein im Genesen begriffenes Kind, oder solche Kinder, die von den „Ferienkolonien“ zurückkommen, sich an Gewicht verhalten – dass solche periodische Wägungen sehr w e r t h l o s e u n d f a l s c h e R e s u l t a t e geben können. RMH: Die wöchentliche Periode ist aus den Gewichtszahlen eliminirt. RMH: In dem ersten Jahre waren in der Anstalt 72 Knaben und 58 Mädchen, welche am 11. September 1882 zusammen 8822 Pfund wogen. Im folgenden Jahre hatte die Anstalt 71 Knaben und 55 Mädchen, deren Gewicht am 11. September 1883 8804 Pfund war. Weil also die Gewichtssumme sämtlicher Kinder in beiden Jahren fast dieselbe ist, und weil im letzten Jahre viel mehr Zöglinge in den älteren Klassen waren als im ersten Jahre, habe ich die Zahl der Kinder in beiden Jahren zu circa 130 setzen können. JMC: Obviously, Malling-Hansen is using a large scale display of his graphic illustrations of curves in order to illustrate his presentation. RMH: Über eine Ausnahme im Jahre 1883 siehe das Weitere unten. RMH: 1 Kilogramm = 2 Pfund dänisch. Fig. 2 from the original book. Hiervon ein Beispiel. Sie sehen hier (Fig. 2) die Gewichtskurven dreier Knaben (oder dreier Klassen von Knaben), die in den Ferienkolonien gewesen sind. Weil diese 3 Kinder täglich gewogen sind, ist es leicht zu sehen, welcher von ihnen kräftig an Gewicht zunimmt, nämlich dieser (Nr. 1), und welcher im Stillstand begriffen ist, dieser (Nr. 3). Gesetzt aber, man hätte auf gewöhnliche Weise den Zuwachs dieser Kindernach den Ferien bestimmen wollen, und hätte sie alle an diesem Tage (A. ), dem Tage der Heimkehr von den Ferien, gewogen, und dann wiederum an diesem Tage (B.) alle, einen Monat (z.B.) nach der Heimkehr (diese Art Wägung geschieht ja, wie Sie wissen, meine Herren, häufig), - was wäre dann das Resultat gewesen? Man würde dann gefunden haben, dass dieser Knabe (Nr. 3), oder die Knabenabtheilung, an Geweicht 30 zugenommen hätte. Also: der durch die täglichen Wägungen als stillstehend gestempelte Knabe würde nach den 2 vereinzelten Wägungen ganz irrig für den kräftigsten gehalten werden, während dagegen Nr 2 – hier – nach den zweimaligen Wägungen ebenso fehlerhaft für den schwächeren gehalten werden könnte, und der kräftigste Knabe (Nr. 1) für einen im Stillstand begriffenen. D i e g e w ö h n l i c h e n, b i s j e t z t a u c h v o n d e r W i s s e n s c h a f t b e n u t z t e n v e r e i n z e l t e n W ä g u n g e n k ö n n e n a l s o i m h ö c h s t e n G r a d e i r r e l e i t e n d u n d s o m i t s c h ä d l i ch s e i n, während dagegen die täglichen Wägungen feste und zuverlässige Resultate geben müssen. Über das Warum der gezeigten, merkwürdig verschiedenen 3 Gewichtsperioden in jedem Jahre muss ich bis auf weiteres schweigen. Nur in Betreff dieser auffallenden Stockungen und vereinzelten Gewichtsverluste (Fig. 1) werde ich mir eine kurze Bemerkung erlauben, indem ich in Betreff des Weiteren hierüber auf meine Brochüre verweise ; dieselbe wird nach der Zusammenkunft an etwaige Liebhaber vertheilt werden. E i n e A b n a h m e d e r W ä r m e von 2° C. Von der mittleren Temperatur von 2 Tagen zu derjenigen der nächsten 5 Tage wird von einer Abnahme der Gewichtsvermehrung bis zu einem Neuntel begleitet. E i n e W ä r m e s t e i g e r u n g von 3° C. von der mittleren Temperatur von 5 Tagen bis zu der der nächsten 5 Tage wird von einer dreizehnfach erhöhten Steigerung der Gewichtsvermehrung begleitet (siehe die Broschüre). Und ferner: E i n J a h r m i t v i e l e n W ä r m e v e r ä n d e r u n g e n wird der normalen Gewichtsvermehrung eines Kindes weit ungünstiger sein als ein Jahr mit wenigen derartigen Schwankungen. E i n e R e i h e v o n m e h r e r e n s o l c h e n u n g ü n s t i g e n J a h r e n w i r d m e h r e r e J a h r g ä n g e v o n m i n d e r k r ä f t i g e n K i n d e r n e r g e b e n, u n d u m g e k e h r t. Die Schwankungen der körperlichen und geistigen Kräfte der wechselden Generationen wurzeln vielleicht z u m T h e i l in meteorologischen Verhältnissen. Betrachten wir in dieser Beziehung noch einmal Fig. 1. 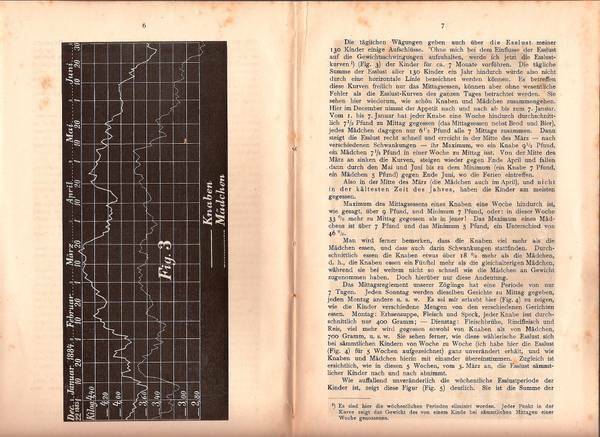 In diesem Jahre hier, 1882, Spätherbst und Vorwinter, finden sich viele und bedeutende Wärmeabnahmen, und zugleich viele und bedeutende Stockungen und Verluste in der Gewichtsentwickelung der Kinder. 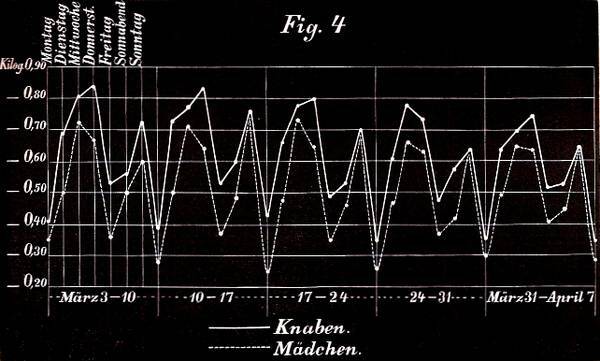 Hier dagegen, in derselben Zeit 1883 – nur wenige und kleine Wärmeabnahmen, und dann auch eine kräftige und freie Wachsthums-Entwickelung im Gegensatz zum vorigen Jahre. Fig. 3 from the original book. Die täglichen Wägungen geben auch über d i e E s s l u s t meiner 130 Kinder einige Aufschlüsse. Ohne mich bei dem Einflusse der Esslust auf die Gewichtsschwingungen aufzuhalten, werde ich jetzt die Esslust-Kurven (Fig. 3) der Kinder für ca. 7 Monate vorführen. Die tägliche Summe der Esslust aller 130 Kinder ein Jahr hindurch würde also nicht durch eine horizontale Linie bezeichnet werden können. Es betreffen diese Kurven freilich nur das Mittagsessen, können aber ohne wesentliche Fehler als die Esslust-Kurven des ganzen Tages betrachtet werden. Sie sehen hier wiederum, wie schön Knaben und Mädchen zusammengehen. Hier im December nimmt der Appetit nach und nach ab bis zum 7. Januar. Vom 1. Bis 7. Januar hat jeder Knabe eine Woche hindurch durchschnittlich 7⅓ Pfund zu Mittag gegessen (das Mittagsessen nebst Brod und Bier), jedes Mädchen dagegen nur 6⅕ Pfund alle 7 Mittage zusammen. Dann steigt die Esslust recht schnell und errreicht in der Mitte des März – nach verschiedenen Schwankungen – ihr Maximum, wo ein Knabe 9⅓ Pfund, ein Mädchen 7⅓ Pfund in einer Woche zu Mittag isst. Von der Mitte des März an sinken die Kurven , steigen wieder gegen Ende April und fallen dann durch den Mai und Juni bis zu dem Minimum (ein Knabe 7 Pfund, ein Mädchen 5 Pfund) gegen Ende Juni, wo die Ferien eintreffen. Also in der Mitte des März (die Mädchen auch im April), u n d n i c h t i n d e r k ä l t es t e n Z e i t d e s J a h r e s, haben die Kinder am meisten gegessen. Maximum des Mittagsessen eines Knaben eine Woche hindurch ist, wie gesagt, über 9 Pfund, und Minimum 7 Pfund, oder: in dieser Woche 33% mehr zu Mittag gegessen als in jener! Das Maximum eines Mädchens ist über 7 Pfund und das Minimum 5 Pfund, ein Unterschied von 46%. Man wird ferner bemerken, dass die Knaben viel mehr als die Mädchen essen, und dass auch darin Schwankungen stattfinden. Durchschnittlich essen die Knaben etwas über 18% mehr als die Mädchen, d.h., die Knaben essen ein Fünftel mehr als die gleichalterigen Mädchen, während sie bei weitem nicht so schnell wie die Mädchen an Gewicht zugenommen haben. Doch hierüber nur diese Andeutung. Das Mittagsreglement unserer Zöglinge hat eine Periode von nur 7 Tagen. Jeden Sonntag werden dieselben Gerichte zu Mittag gegeben, jeden Montag andere u.s.w. Es sei mir erlaubt hier zu zeigen, wie die Kinder verschiedene Mengen von den verschiedenen Gerichten essen. Montag: Erbsensuppe, Fleisch und Speck, jeder Knabe isst durchschnittlich nur 400 Gramm; - Dienstag: Fleischbrühe, Rindfleisch und Reis, viel mehr wird gegessen sowohl von Knaben als von Mädchen, 700 Gramm, u.s.w. Sie sehen ferner, wie diese wählerische Esslust sich bei sämmtlichen Kindern von Woche zu Woche (ich habe hier die Esslust (Fig. 4) für 5 Wochen aufgezeichnet) ganz unverändert erhält, und wie Knaben und Mädchen hierin mit einander übereinstimmen. Zugleich ist ersichtlich , wie in diesen 5 Wochen, vom 3. März an, die Esslust sämmtlicher Kinder nach und nach abnimmt. RMH: Es sind hier die wöchentlichen Perioden eliminirt worden. Jeder Punkt in der Kurve zeigt das Gewicht des von einem Kinde bei sämmtlichen Mittagen einer Woche genossenen. Fig. 4 from the original book. Fig. 5 from the original book. Wie auffallend unveränderlich die wöchentliche Esslustperiode der Kinder ist, zeigt diese Figur (Fig. 5) deutlich. Sie ist die Summe der Esslust in 29 Wochen und stellt ganz dieselbe Figur vor, wie die fünf einzelnen Wochen. Jeden Donnerstag (Gerstenbrei und Milch, nachher Lobescoves) essen die Knaben also durchschnittlich 50% mehr als am Freitag (Kohlsuppe mit Schweinrücken), und 100% mehr als an jedem Montage. Die grössten Schwankungen bei einzelnen Mittagsmahlen bewegen sich zwischen nur 2 8 0 G r a m m durchschnittlich pr. Zögling bei einem Mittagsessen und 9 5 0 G r a m m bei einem anderen, freilich einem Festmittag, des Königs Geburtstag. r e g l e m e n t der Anstalt mit den Forschungsresultaten der Ernährungsphysiologie durchaus nicht in Übereinstimmung wäre. Ich fasste daher den Entschluss, die Zöglinge während der Dauer eines Jahres zu wägen und zu messen, um zu erfahren, wie sie bei dem bestehenden Verpflegungsreglement gediehen, in so fern das Gedeihen sich durch Wägungen und Grössenmessungen bestimmen liesse. Demnächst wurden von wissenschaftlicher Autorität und nach meiner Aufforderung das alte Verpflegungsreglement und die Kostenrationen einer durchgängigen Kritik unterworfen. Es zeigte sich, dass das Reglement in Beziehung auf die gegebene Menge der Nahrungsmittel so ziemlich tadellos war, während es in anderen beziehungen grosse Fehler und grosse Mängel hatte; Es erhielten die Zöglinge jeden Morgen nur eine dünne Biersuppe, und allzu viel von diesem Biere den Tag hindurch, allzu viel Schwarzbrod, kein Weizenbrod und fast keine Milch; ausserdem waren der verabreichten Albuminate zu wenig. Die Fehler des Reglements culminirten in dem fast lächerliche Umstande , dass die Kinder in den letzten drei Tagen jeder Woche allzu viel Fett und Kohlenhydrate erhielten, während die ersten Tage jeder Woche in dieser Beziehung sehr dürftig waren. Ebenso auffallend der wissenschaftlichen, physiologischen Kritik gegenüber war die ungleiche Vertheilung der Albuminstoffe, Fette und Kohlenhydrate in dem Mittagsessen. Es enthielt das alte Reglement folgende Absonderlichkeiten: Von Albuminaten war in dem Mittagsessen das Maximum 58 Gramm pr. Portion und Minimum 24 Gramm – ein zu grosser Unterschied; von den Fetten war Maximum 117, Minimum – nur 9. Ebenso in Betreff der Kohlenhydrate: Maximum 109 und Minimum – nur 3. Alle diesen Fehler wurden verbessert, und die Kinder erhielten von jetzt an Morgens und Abends Milch statt des dünnes Bieres, und anstatt der Hälfte des Schwarzbrodes Weizenbrod. Die Albuminate, Fette und Kohlenhydrate wurden gleichmässig über die Woche in passender Menge bei jeder Mahlzeit vertheilt. Ausserdem wurden viel mehr Albuminate als früher gegeben: Vorher erhielt jeder Zögling 78 Gramm Albuminate täglich und durchschnittlich, jetzt dagegen 107, oder 37% täglich mehr von reinen Albuminaten als früher. Von Fett und Kohlenhydraten gab das neue Reglement etwas weniger als das frühere. Meine Herren! Das neue Verpflegungsreglement trat am 16. Mai 1883 in Kraft, hat also über ein Jahr bestanden. Wollen wir jetzt die Resultate des neuen Reglements - i n s o f e r n d i e s e l b e n s i c h a n V e r ä n d e r u n g e n i m K ö r p e r g e w i c h t des Kindes kundgeben - untersuchen und mit den Resultaten des alten Reglements vergleichen. Um die volle Bedeutung der t ä g l i c h e n Wägungen bei diesen hochwichtigen Untersuchungen recht deutlich und scharf zu sehen, wollen wir uns zuerst vorstellen, dass wir die Kinder nicht täglich gewogen hätten, sondern in den 2 Jahren nur 4 Mal, nämlich den 11. September 1882 und den 11. Mai 1883, demnächst den 11. Septbr. 1883 und 11. Mai 1884. Aus diesen 4 Wägungen , welche nach der allgemeinen bisherigen Praxis hinlänglich sein würden, könnten wir dann ersehen (Fig. 1), dass die Knaben in den 8 Bier- und Schwarzbrodmonaten (vom 11. Septbr. 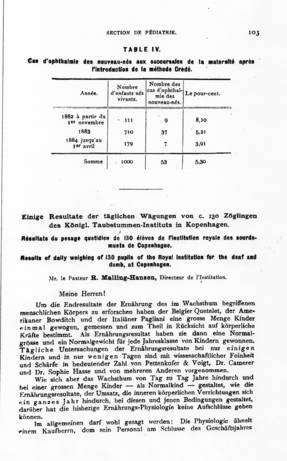 1882 an) nur 310 Pfund an Gewicht zugenommen hätten, in den 8 milch-, weizenbrod- und albuminatenreichen Monaten dagegen 415 Pfund, d.h. ein Drittel mehr, und dass die Mädchen in den letzten 8 Monaten ca. ein Viertel mehr an Gewicht zugenommen hätten als in den anderen 8 Monaten. Seien wir aber nicht zu voreilig mit unserer Dankadresse. Freilich haben uns die 4 – gewöhnlich für hinlänglich abgesehenen – vereinzelten Wägungen von dem grossen Vortheil des neuen Reglements erzählt; - w a s s a g e n a b e r d i e t ä g l i c h e n M a s s e n w ä g u n g e n a l l e r K i n d e r? Wenden wir uns jetzt dahin. Ja, meine Herren, Sie sehen dann, d a s s d i e K n a b e n i n d i e s e n s e c h s t e h a l b M o n a t e n d e r a c h t Biermonate ebenso gut wie in der parallelen Zeit der acht Milchmonate gedichen sind. Aber, meine Herren, das ist ja höchst bedenklich! In diesen 5½ Monaten hat das neue, wissenschaftlich begründete Reglement also durchaus keine vortheilhafte Einwirkung auf das Gedeihen der Kinderkörper gehabt, wie es ja eben haben müsste. Aber, denken wir weiter, die vier Einzelwägungen haben ja ergeben, dass die Knaben zusammen in den acht Milchmonaten 105 Pfund mehr als in den acht Biermonaten zugenommen haben, wo sind denn diese Pfunde? – Gut, dass wir die t ä g l i c h e n Wägungen haben; wir können antworten: Ja, hier, in diesen 5½ Monaten (vom 22.Novbr. 1883 bis zum 11. Mai 1884) sind sie nicht; wir wollen sie aber aufsuchen. Also, wir zeichnen den Rest der Knabenkurven, der Bierkurven (vom 11. Septbr. 1882 bis zum 22. Novbr. 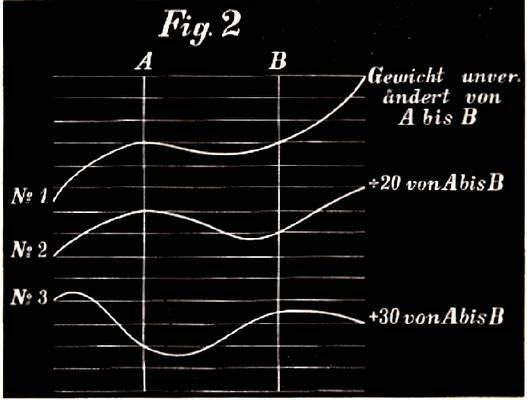 Desselben Jahres) durch, legen sie auf die betreffende Milchkurve von 1883 (Fig. 6) und sehen dann, dass von 11. Septbr. an bis zum 11. October die Knaben w i e d e r u m g l e i c h g u t in den beiden Jahren gediehen. Also nur, n u r i n d e r Z e i t v o m 11. O c t o b e r a n b i s z u m 22. N o v b r. s i n d d i e K n a b e n b e s s e r i n d e m M i l c h j a h r e a l s i n d e m B i e r j a h r e g e d i e h e n. A l l e 105 P f u n d Z u w a c h s, d i e w i r h ü b s c h ü b e r d i e 8 M o n a t e v e r t h e i l t z u f i n d e n g e g l a u b t h a t t e n (n a c h d e n v i e r E i n z e l w ä g u n g e n z u u r t h e i l e n ), a l l e d i e s e 105 p f u n d s t e c k e n i n n u r d i e s e n k a u m a n d e r t h a l b M o n a t e n.
Können wir jetzt den grossen Zuwachs der Knaben in diesen anderthalb Monaten dem neuen reglement zuschreiben? Ich zweifle sehr daran, denn in der Parallel-Zeit des vorhergehenden Jahres fanden mehrere plötzliche und grosse Temperaturwechselungen statt, die ganz deutlich (Fig. 1) hier und da ihren hemmenden Einfluss auf die Körperentwickelung der Kinder gehabt haben. In dieser Zeit dagegen (11. October – 22. Novbr. 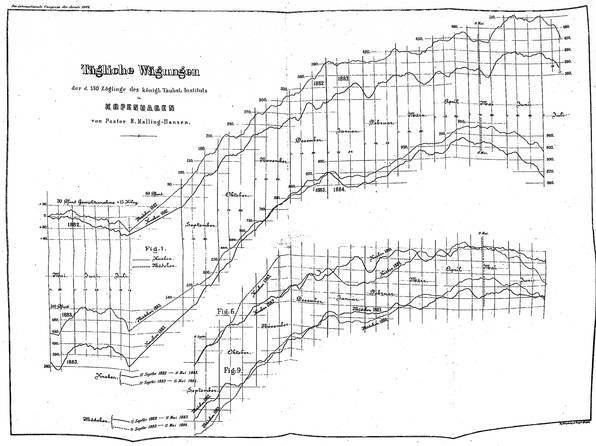 1883) waren keine solche plötzliche Temperaturwechsel. Es ist also genügender Grund vorhanden, um die grosse Körperentwickelung der Kinder in diesen anderthalb Monaten dem milden und ruhigen Klima und nicht dem neuen Reglement zuzuschreiben. Ausserdem: es würde ja auch ein recht eigenthümliches Verköstigungsreglement sein, dass nur in anderthalb Monaten von den 8 Monaten, worin es thätig war, seine gute Eigenschaften bewährt hätte. In Betreff der Mädchen würden uns solche 4 vereinzelte Wägungen wie die früher erwähnten der Knaben belehren, dass die Mädchen in den 8 Milch-Monaten um 76 Pfund mehr als in den 8 Bier-Monaten an Gewicht zugenommen hätten. Nach Behandlung der Mädchenkurven (Fig. 9 auf der hinten angehefteten Tafel) in derselben Art wie früher der Knabenkurven, zeigt es sich aber, dass auch diese 76 Pfund nicht über die ganzen 8 Monate, ja nicht einmal über die Hälfte derselben vertheilt sind, sondern dass sie zum Theil im October 1883 (wie die 105 Pfund der Knaben), zum Theil in einigen Tagen im März und im Mai 1884, alles in allem in nur 32 Tagen, oder in nur einem siebenten Theil der 242 Tage der betreffenden 8 Monate zu finden sind. RMH: Fig. 7 zeigt die betreffenden Temperaturschwingungen; Fig. 8 zeigt die Gewichtsdifferenzen der Knaben. Die Zahlen sind nach der Formel (a + 2b + c)/4 behandelt. Fig. 7 and 8 from the original book. G e w i c h t f a l l der sämmtlichen Kinder in der genannten Zeit volle 106 Pfund grösser unter dem neuen Verköstigungsreglement als unter dem alten. Ich brauche Nichts hinzufügen. Meine Herren! Die 4 vereinzelten Wägungen belehrten uns, dass das Milch-Weizenbrod-Albuminaten-Reglement unsern Kindern 8 Monate hindurch eine weit grössere Vermehrung des Körpergewichtes gegeben hatte als das alte fehlerhafte Reglement in dem vorhergehenden Jahre. Das lehrten uns die 4 vereinzelten Wägungen, während die täglichen Wägungen das Falsche dieser Annahme unumstösslich gezeigt haben, und haben die Massenwägungen zugleich von Tag zu Tag zeigen können, wie die Gewichtssteigerung sich in dem einen Jahre zu der in dem anderen Jahre verhält, und fest bestimmen können, dass wir dem neuen, wissenschaftlich begründeten Reglement keine durch Wägung der Kinder festzustellenden Vortheile vor dem alten, fast lächerlichen Reglement beilegen können. Aber, aber, meine Herren, dass neue, wissenschaftlich begründete Reglement muss durchaus dem veralteten Reglement gegenüber bessere Resultate gegeben haben. Sind denn diese besseren Resultate nirgends zu spüren? – Gewiss, und ich werde Ihnen die sicheren und ganz bestimmten Wirkungen des Milch-Weizenbrod- und Albuminaten-Plus zeigen. Hier (Fig. 1) sind die Wirkungen zu sehen; in diesen – nur 21 Tagen, und nur in diesem kleinen Theil der Jahresherrschaft des neuen Reglements, sind die guten Wirkungen desselben ersichtlich. Die Knaben und Mädchen haben hier vom 1. bis 15. Mai 1883 die gewöhnliche Gewichtsabnahme begonnen. Den 16. kommt die Reglementsverbesserung , und schon vom 18. an (anstatt die Gewichtsabnahme fortzusetzen) nehmen jetzt Knaben und Mädchen, alle 130 Kinder in schönster Eintracht, gewaltig an Gewicht zu. Es dauert aber diese Gewichtszunahme, die so gross ist wie die Zunahme in den besten Gewichtssteigerungszeiten, nur 21 Tage; vom 6. Juni an stehen Knaben und Mädchen 14 Tage still, und verlieren dann wiederum – wie früher – im Juni nach und nach an Gewicht. Das neue unfehlbare Verpflegungsreglement, für Jahre abgefasst, hat also nur 21 Tage genützt – hat also Nichts genützt. Es hat nichts genützt, Milch die Menge statt dünnes Bier zu geben; es hat nichts genützt, Weizenbrod statt Schwarzbrod zu geben; is hat nichts genützt, viel mehr von den das Wachsthum fordernden Albuminaten zu verabreichen; es hat nichts genützt, dass die lächerliche Vertheilung der Fette und Kohlenhydrate gehoben wurde. Die Nahrungsmittel haben, einer Prüfung durch tägliche Wägungen sämmtlicher 130 Versuchsobjecte unterworfen, die ihnen beigelegten Werthe nicht behauptet. Es scheint auch, dass das alte Reglement die (im Verhältnis zu den gegebenen Kinderkörpern, deren Beschäftigung und deren äusseren Umständen) nöthige Menge der verschiedenen Nahrungsmittel verabreicht habe, und das deshalb die Körper das Plus der durch das neue Reglement gegebenen Kost nicht haben ausnützen können. Waren aber, wird man sagen, die localen und andere verhältnisse in der Anstalt nicht besonders ungünstig in dem Milchjahre? Ich antworte: Sämmtliche Öconomielieferanten waren dieselben in beiden Jahren, die Preise und die Waaren dieselben; die Öconoma, ja selbst alle die bei der Zubereitung des Essens thätigen Dienstmädchen, alle unverändert dieselben in den beiden Jahren. Die Tagesordnung, die sämmtlichen Arbeiten der Zöglinge in der Schule, in den Werkstätten u.s.w. – alles unverändert, und in den beiden Jahren keine einzige epidemische Krankheit unter den Kindern. Kurz, ich darf sagen: es ist kaum denkbar, dass die localen Verhältnisse in dem einen Jahre anders sein könnten als indem andern. Also – von hier aus keine schädlichen Einflüsse in dem Milchjahre. Aber, wird man ferner sagen, es ist dieses ja nur ein vereinzeltes Resultat. Ich darf antworten: Es ist das Genannte Resultat nicht aus Experimenten mit nur einem oder zwei, drei Kindern in nur einzigen Tagen, sondern aus Experimenten mit 130 Kindern in 700 Tagen herangewachsen. Es haben diese hier aufgezeichneten Wägungen alles in allem einen Werth von über 90,000 Einzelwägungen, und – da die Knaben im Bierjahre zwei Mal täglich und in der meisten Zeit des Milchjahres vier Mal täglich gewogen wurden, die Hälfte von den Mädchen ebenfalls, - so werden die genannten 90,000 Wägungen von noch ebenso vielen andern Wägungen gestützt. Das heisst: Es steht hier der Werth von gegen 200,000 Einzelwägungen, und ich wage daher zu hoffen, dass die Endresultate meiner Untersuchungen eine recht breite, tiefe und feste Basis haben. Gesetz nun, meine Herren, wir hätten nicht die täglichen Wägungen gehabt, sondern nur die vier erwähnten vereinzelten Wägungen, dann würden wir, wie früher gezeigt, fälschlich geglaubt haben, das neue Reglement wäre weit zweckmässiger als das alte. Und gesetzt ferner, dass wir doch in den ersten 14 Tagen die Resultate des neuen Reglements durch tägliche Wägungen der Kinder geprüft hätten, wir wären dann (in voller Übereinstimmung mit der Ernährungs-Physiologie) genöthigt, den ebenso falschen Schluss zu ziehen, weil das neu Reglement, die neuen Speisen und die neue Speiseordnung in diesem 14 Tagen so gut und schöne Resultate gegeben hätten, so würden sie auch a u f d i e D a u e r solche gute Eigenschaften behalten. - Meine Herren! Sie sehen deutlich den Werth der andauernden täglichen Wägungen, wenn es darum gilt, den wirklichen, den dauernden Werth der Nahrungsmittel zu bestimmen. Auf das jetzt Gewonnene gestützt dürfte vielleicht gesagt werden, dass nirgends in ähnlichen Instituten, Anstalten, Internaten u.s.w. ein altes Verpflegungsreglement nur auf Basis der jetzigen Ernährungsphysiologie verworfen werden darf; es müssten die beiden Reglements, das alte und das geplante neue, auch durch t ä g l i c h e Wägungen (Messungen und Kraftbestimmungen) der Alumnen geprüft werden. Ferner: Es scheint mir, dass die gewonnenen Resultate einen Hauptweg angegeben haben, worauf man durch Versuche in einer Menge Internate, die planmässig mit einander zusammenarbeiten, nach und nach zu einiger Klarheit über die a n d a u e r d e n W e r t h e der verschiedenen Nahrungsmittel, oder die beste, gesundeste und den gegebenen Verhältnissen gemässeste Art der Verköstigung werden kommen können. Geben die Resultate der täglichen Wägungen keine Winke in dieser Beziehung? Ich glaube es, werde aber nur - mit Hinweisung auf die grosse Gewichtszunahme aller Kinder in den ersten 21 Tagen nach Einführung des neuen Reglements und in einer Jahreszeit, wo sonst ein Gewichtsfall zu erwarten war - sagen: falls wir in dem Institute alle drei Wochen mit den beiden Reglements wechselten, so würden wahrscheinlich die Resultate besser werden. Es scheint also, dass diese Worte in der Physiologie von unserm P a n u m (Stofskiftets Fysiologi, 1883, s. 89): „Eine solche Abwechselung (der Ingredienzen und der Zubereitung der Nahrungsmittel) ist durchaus nothwendig, weil eine gar zu einförmige Kost, auch wenn sie an sich gut und hinreichend ist, zuletzt so widerlich wird, dass dieselbe sogar bei heftigem Hunger unmöglich genossen und vertragen werden kann“, - dass diese Worte die grösste Aufmerksamkeit verdienen, und auch in Betreff „ der Abwechselung“ sehr geschärft und erweitert werden können. Als Hauptresultat des hier Gesagten und Vorgezeigten dürfte ich also schliesslich dieses hinstellen : Es scheint wenigstens e i n Beweis geliefert zu sein, dass die Ernährungsphysiologie die a n d a u e r n d e n Wirkungen der verschiedenen Nahrungsmittel auf das fortgesetzte Wachsthum des menschlichen Körpers nicht gekannt habe, und dass wir auf dem gezeigten Wege hoffentlich nach und nach diesen Wirkungen werden nachspüren können. Es werden sich hier ungemein viele Einzelaufgaben einstellen, und ungeheuer viele Arbeit nothwendig werden. Möchte ich doch einige von den geehrten Herren für die Durchprüfung aller der schon gewonnenen Resultate meiner Wägungen und Messungen, und demnächst vielleicht für die Theilnahme an solchen, zugleich planmässigen und regulirten Arbeiten bei verschiedenen Internaten in verschiedenen Ländern gewonnen haben. Handelt es sich ja doch um das Höchste in der Ernährungsphysiologie, die Bestimmung der Nahrungswerthe, und handelt es sich um das körperliche, zugleich dann auch geistige Gedeihen, das volle und kräftige Gedeihen unserer Kinder, um die Kräftigung künftiger Geschlechter. This copy of Fragment II once belonged to Malling-Hansen's daughter, Emma Mathiesen. Notice her signature. CONGRÈS PÉRIODIQUE INTERNATIONAL DES SCIENCES MÉDICALES 8me SESSION - COPENHAGUE 1884. Research, transcription and footnotes by Jørgen Malling Christensen and Sverre Avnskog. 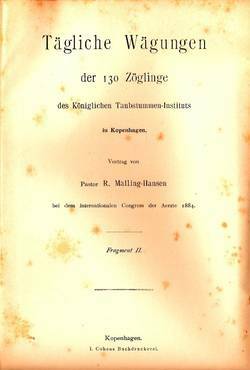 Malling-Hansen's lecture was also printed in the official report from the congress in Copenhagen, published in 1886. Sverre found the report, in four large volumes, at the Norwegian National Library. A short discussion that followed Malling-Hansen's lecture is also printed. The text documents the important and very supportive comments from the chairperson of the session, Dr. Rauchfuss, as well as from Prof Jacobi, in response to the presentation by Malling-Hansen. DR. RAUCHFFUSS, de St. Pétersbourg: Meine Herren! Es scheint mir, dass gegenüber so grossartigen Untersuchungen, in denen eine solche Fülle von Arbeit und so neue Gesichtspuncte nach einem erst während des Vortrags sich entwickelnden Plane und in so kurzer Zeit uns vorgeführt werden, es einer gewissen Sammlung bedarf, um Fragen zu stellen oder Meinungen auszusprechen. Nicht in diesem, einer Discussion zunächst entsprechenden Sinne, ergreife ich das Wort. – Ich möchte nur darauf hinweisen, dass mit den späteren Messungen und Wägungen des Herrn Malling-Hansen in den späteren Perioden des Kindesalters eine für die Physiologie dieser Altersperiode wie für die wissenschaftlichen und praktischen Bedürfnisse der Pädriatrie in gleichem Masse bedeutungsvolle Lücke in unserem Wissen sich auszufüllen beginnt. Wir haben ganz neue Untersuchungsreihen vor uns, die schon lange ein dringendes Bedürfniss waren. Wir verlassen diesen Vortrag gewiss Alle mit der gleichen Anregung zu ähnlichen eigenen Forschungen, oder doch zur Förderung derselben in unserer Heimath, und mit dem Wunsche, die heute von uns bewunderten Untersuchungen möchten durch eine auf alle Details eingehende Veröffentlichung recht bald Gegenstand unseres Studiums werden, dem wir uns dann mit Musse und eingehend werden widmen können. Für heute müssen wir uns darauf beschränken dem Herrn Malling-Hansen unseren tiefgefühlten Dank für das Gehörte auszusprechen. Prof. JACOBI, de New-York: Die Bedeutung der vortragenen Arbeit stelle ich so hoch wie Prof. Rauchfuss. Aber man muss nie aus dem Auge verlieren, dass Gewicht und Gesundheit nicht parallel zu gehen brauchen. Mässige Gewichtszunahme ist nur eines der Symptome der Gesundheit eines Organismus oder eines Organes. Auch die beliebten Kinderwägungen sind nicht so conclusiv wie der Enthusiasmus geglaubt hat. Rachitische Kinder sind oft fett und wiegen schwer. Die physiologischen Gesetze werden also nicht umgestossen, wenn man sagt, dass eine kohlenstoffhaltige Nahrung mehr Gewicht macht als eine albuminhaltige. Trotz der Möglichkeit der Existenz, auch unter ungünstigen Umständen, muss doch als Regel gelten, dass die Nahrung des Organismus den chemischen Bestandtheilen des Organismus einigermassen entsprechen muss. Dr. RAUCHFUSS: Ich bin mit dem von Prof. Jacobi Gesagten vollkommen einverstanden, soweit es sich im Allgemeinen auf die Vernachlässigung gewisser Cautelen in der Verwerthungsresultaten handelt. So hat man zuweilen den Erfolg gewisser Ernährungsmethoden, besonders bei der vergleichweisen Anwendung verschiedener Surrogate der Muttermilch, zu einseitig durch die Zunahme des Körpergewichts zu beweisen gesucht und gegen solche Einseitigkeiten richten sich die Bemerkungen des Prof. Jacobi. Im gegebenen Falle scheint mir im ganzen Untersuchungsplan, so wie in dem Umstande, dass Forscher, Pädagog und Anstaltsdirector einer Person sich vereinigen, - die Garantie gegen solche einseitige Schätzung der Wägungsresultate zu liegen. Aber selbst, wenn wir von dem ganzen Plan und den verschiedenen Fragen absehen, welche sich Herr Malling-Hansen im Verlaufe seiner Untersuchungen gestellt, so ist schon die Tatsache an sich, dass er die Wissenschaft mit täglichen Wägungen und Messungen bereichert, welche sich über einen grossen Abschnitt des Kindesalters erstrecken, von unschätzbarem Werthe. Wenn wir zurückdenken an die Zeit, als wir nur die monatlichen Wägungen und Messungen von B o u c h a u d für das Säuglingsalter, und die jährliche von Q u e t e l e t für das spätere Kindesalter besassen und auf diesen lückenhaften und zum Theil nicht direct beobachteten, sondern erst berechneten Zahlen unserer Vergleiche und Schlüsse aufbauten, wie wir dann alle erfreut waren über die fortlaufenden Wägungen F l e i s c h m a n n´s u. bes. A h l f e l d t´s und der Weningen,die ihnen nacheiferten, und wie wir dann schliesslich in den Untersuchungen von K o t e l m a n n, B o w d i t c h, P a g l i a n i über das spätere Kindesalter, trotz des grossen Materials, welches hier zusammengetragen wurde, doch nur Mittelzahlen für die einzelnen Lebensjahre ohne inneren Zusammenhang besitzen, dann können wir für das, was uns heute geboten wurde, nich dankbar genug sein. Haben wir uns doch begnügen müssen mit jenen Mittelwerthen aus grossen Zahlen und sie als massgebend acceptiren müssen, wenn wir gleich nicht wussten, ob die Körpergewichtszunahmen, welche in denselben enthalten sind, per fas oder per nefas erworben wurden. Wenn wir nach dem Allen auch nur den täglichen, fortlaufenden Wägungen und Messungen Herrn Malling-Hansen´s, mit ihren Beziehungen zu Alter und Geschlecht, selbst abgesehen vom Plane seiner Untersuchungen, von den Schlüssen und Anregungen, die sich daraus ergeben, gegenüberständen, so müssten wir auch dann sagen: es ist eine wesentliche Lücke unserer Kenntnisse über die Wachsthumsverhältnisse durch einen reichen Beitrag von Thatsachen ausgefüllt worden. Pastor MALLING-HANSEN dankte der Versammlung und zeigte durch Citate aus dem gehaltenen Vortrage, dass er mit Prof. Jacobi ganz einverstanden sei, wie auch, dass das betreffende Verköstigungsreglement in voller Übereinstimmung mit der Wissenschaft wäre, dass sich dasselbe also nicht das Fettmachen der Kinder zur Aufgabe gestellt habe, sondern dass es eine gesundere und kräftigere Entwicklung als diejenige, welche das veraltete Reglement vermeintlich geben könne, bezweckt habe, und somit auch eine grössere Gewichtszunahme der Kinder als früher anstrebe. Wider alles Erwarten habe (wie gezeigt) das neue Verköstigungsreglement diese Zwecke nicht erreicht. 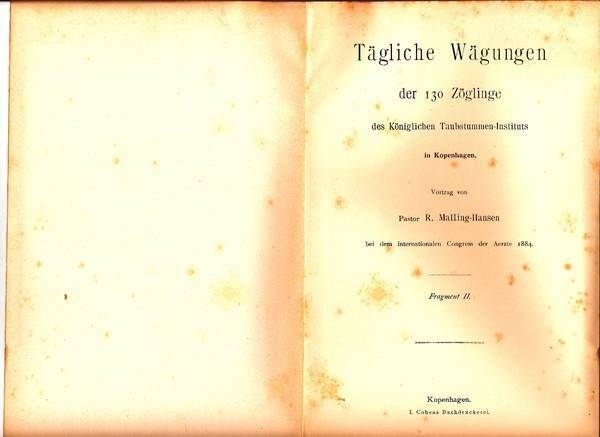 JMC: Malling-Hansen’s lecture is on our site, entitled: “Fragment II: Tägliche Wägungen der 130 Zöglinge”. JMC: Karl (or Carl) Andreyevich Rauchfuss, 1835 / 1915, a Russian internist active in St. Petersburg. He specialised in paediatrics and later in laryncology. Director and physician at the Findelhaus, a hospital and orphanage and from 1869 director and physician-in-chief at the St.Petersburg children’s hospital. As from 1876 also imperial life paediatrician to the Russian court. Rauchfuss was founder of the Society of Paediatricians in St. Petersburg. JMC: Abraham Jacobi, 1830-1919, German physician who settled in the USA in 1853 and became a pioneer of paediatrics, opening the first children’s clinic in the United States. He taught at Colombia University from 1870 until 1902. In 1882 he was president of the New York State Medical Society and in 1885 became president of the New York Academy of Medicine. From 1868 to 1871 he was joint editor of the American Journal of Obstetrics and Diseases of Women and Children. He published works on women’s and children’s diseases, nutrition of infants, and diphtheria. His Sarcoma of the Kidney in the Foetus and Infant is printed in the Transactions of the International Medical Congress in Copenhagen. The Jacobi Medical Center in New York was named in his honour (source: Wikipedia). JMC: Lambert Adolphe Jacques Quetelet, 1796 – 1874, Belgian statistician, astronomer, mathematician and sociologist, particularly known for his contributions to population statistics. Regarded as the founder of modern statistics. Quetelet became a member of the Royal Swedish Academy of Science in 1850. He invented the concept of Body-Mass Index, still widely in use. JMC: Ludwig Kotelmann, 1839-1908, German theologian, teacher, opthalmologist and medical historian. 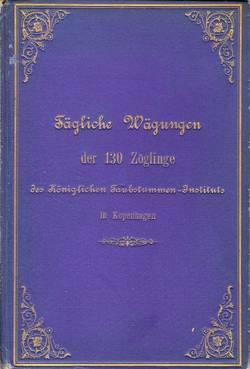 He edited and published several works about school health issues: Über Schulgesundheitspflege (1895); Zur Gesundheitspflege in den höheren Mädschenschulen (1897); Schoolhygiene for Teachers (1899). JMC: Henry Pickering Bowditch, 1840 – 1911, American physiologist. He studied for several years in Europe, one year in France and two years in Leipzig with Prof Carl Ludwig. From 1876 until 1906 B. Was professor of physiology at Harvard University. He was interested in Anthropometry and showed that nutrition and ecological factors contribute to physiological development. JMC: Luigi Pagliani, 1847 – 1932, Italian physician and specialist in hygiene, who played a very important role in the field of public hygiene, publishing several works on this subject and about the development of the human body sanitary and in unhealthy conditions. The front page of the original report. The beginning of Malling-Hansen's lecture.